Whew! These last three weeks have been a whirlwind! We drove over 4000 miles - went through 6 states and got to see a whole lot of great people. It was a wonderful Christmas and New Year - now back in Chicago ready to jump back in to my regular life (although my regular life is anything but regular!) I decided to do a different Bible plan this year - the first 2 months are on people of the Bible. I'm excited to look at scripture from a little bit of a different perspective. Today, I read about Noah. 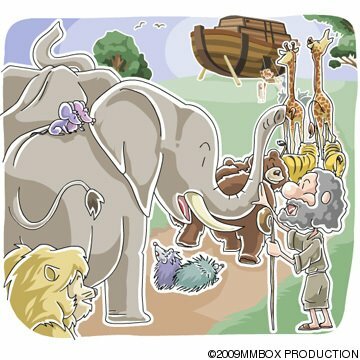 Very familiar story - but loved looking at it as it particularly pertains to the man, Noah. Yes - that Noah. The one with the ark. The one who built a huge boat when very likely, no one had ever seen rain. DIFFERENT - Noah didn't blend in with the crowd or the current culture. He stood out as a believer in the one true God. GOOD MAN - Maybe this is hard to define, but we know it when we see it. When I think about my husband, Alan, my Dad and my father in law - something that always comes to mind is that they are good men. They are the total package of all these characteristics that the Lord values. Not a bad way to be described! WALKED WITH GOD - Noah's heart was with the One who mattered most. His time was invested in spiritual things. He was willing to be obedient at any cost. He trusted the Lord and had tremendous faith. GOD LIKED WHAT HE SAW - Oh, for that to be the Lord's summation of my life! Moses was an obedient servant who was not afraid to look like a fool in the world's eyes. He was singularly focused on God's mission. When I look ahead at 2013, I can not imagine anything that I would like more than to be characterized as someone who is different, a good woman, a woman of integrity, one who walks with God and is pleasing to the Lord. Are you different? Do you stand out in our current culture or do you easily blend in? What does it mean to you to be a good man or woman in a godly sense? Do you desire to walk with God above all else? Does God like what He sees? Good questions to ponder. Don't ever lose sight of the fact that God's grace is sufficient in our weaknesses. This is meant to encourage you to strive to be more Christlike this year - not to depress you! Noah certainly had his struggles, too. I am so inspired to be a godly woman as I look at the life of Noah. May his life inspire you to be everything that the Lord has for you. Let's flood our culture with His love. Let's be bearers of peace in a tumultuous time by holding out an olive branch to others. Let's be known as people of integrity where we live, worship and work. Let's be known as those who "walk with God."